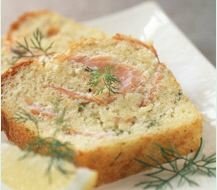 Smoked salmon, chive and lemon cake: An idea for your next party table. 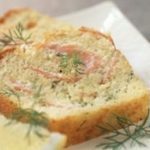 Our recipe and technique for making smoked salmon cake can be used to to invent your own depending on what you are serving.The average French housewife will cook up to 8 small meals everyday. 4 for lunch and 4 for dinner. She has therefore, to be rather inventive in order to provide diversity. 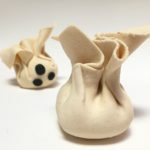 This savoury cake, or bread, has been born out of this inventiveness and makes a nice change to bread. Preheat the oven in 180°C/360F/Gas 6). Break eggs in a salad bowl and whip them. Sieve the flour and cornflour into the butter, salt, pepper, dill and nutmeg and mix to a paste. Add the salmon, with the zest and juice of the lemon. Coat a 1 lb loaf tin with some butter and a dusting of flour. Pour the paste into the mold and place in the centre of the oven. When the cake has a nice golden colour, lower the temperature of the oven in 170°C/335F/Gas 5. Continue cooking until you can run a toothpick through it and it comes out clean.